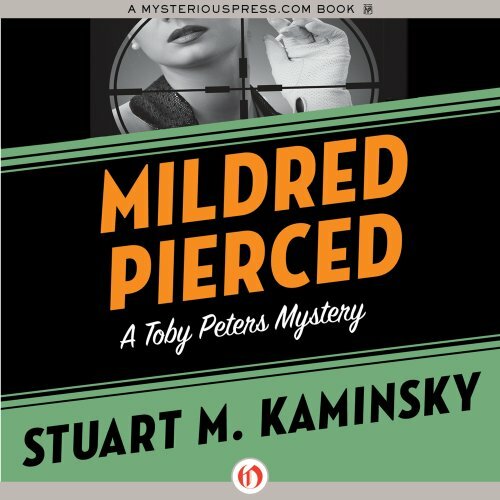 That down-at-the-heels gumshoe, Toby Peters again proves to be “an unblemished delight,” as the Washington Post Book World put it, while his creator, Stuart M. Kaminsky, continues to “make the totally wacky possible,” in a zany new Hollywood adventure. Having survived the hire of such movie luminaries as Humphrey Bogart, Bette Davis, Charlie Chaplin, and Cary Grant, tinsel-town detective Toby finds himself in the employ of an edgy Joan Crawford. Actually, Toby needs Miss Crawford as much as she needs him. His longtime friend and office mate, the mad dentist Sheldon Minck, has been jailed for murder - the victim, his estranged wife, Mildred; the motive, a $200,000 inheritance; the weapon, a crossbow. Only Miss Crawford, the single witness to the crime, can attest to hapless Minck’s innocence. But the former MGM movie queen has just been offered her first film in two years, as the title character in Mildred Pierce, so she is anxious to avoid unpleasant publicity that could cost her the role. So it’s up to Toby to solve the crime, save Minck, and thus keep Miss Crawford’s famous name out of the daily papers. ©2003 Stuart M. Kaminsky (P)2013 Audible, Inc.